RETIRED AND CRAZY- ME? SURELY NOT! : DEMONS OR ANGELS? Here are five of my little angels. As you have probably guessed, this is not their usual garb. Four are dressed for Halloween. 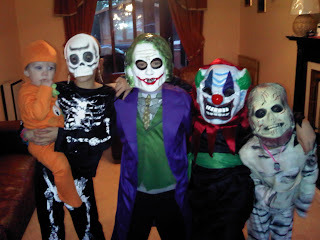 The one on the right won a competition at the school party for being the scariest but I think they would all frighten the s..t out of me on a dark night. Except for the baby of course. He is just adorable. They're all gorgeous. I had about twenty little monsters turn up at my door on Sunday night- all from our cul-de-sac. I knew every one except I could not recognise them with their masks!!! I live in the Country Addy so I don't have any scary monsters visiting me. Thankfully. I don't know which is the scariest mask. I think I would be terrified of all of them on a dark night! Except of course for the baby dressed in a pumpkin colour. He is adorable. Grandchildren are a wonderful blessing, demons or not! My daughter took the photograph Eva so I can't take the credit. Anne, how can they look so cute when they are dressing up in such gruesome costumes? Yes, Maggie, my granddaughter pointed out to me that the baby is in fact dressed up as a pumpkin!